The ignition coil is one of the simplest yet most important components in the ignition system. The engine derives its power from the controlled combustion of a compressed petrol - air mixture. 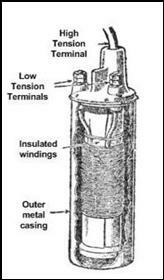 The mixture in the cylinder is ignited by means of a spark across the terminals of a sparking plug. A very high voltage is required in order to create the short duration but very hot spark. This is the objective of the ignition coil. The ignition coil is an enclosed canister, usually but not exclusively metal, in which there are actually two separate coils of wire, the Primary and the Secondary. The Primary winding is two or three hundred turns of wire wound around a cluster of soft iron rods. It is connected between the ignition switch and the points in the distributor. This forms an electromagnet, so that when the points in the distributor are closed, a magnetic field is created in the soft iron. This field takes a small but finite time to grow to full strength. The timing of this growth is set so as to be shorter than the period of time that the points would be closed for when an engine is operating at maximum revs. (Remember that there are two ignition cycles per revolution on a four cylinder engine). 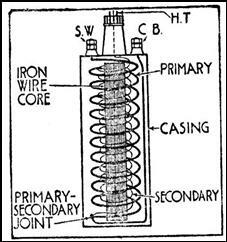 This is why the centre core is made of thin rods rather than a solid block of iron: in formal terms it prevents the set up of eddy currents which counter-act the build up of the magnetic field. Just before the points open, the field has grown to its maximum strength, which is set by the resistance of the winding and the applied voltage, (6V or 12V depending on the battery, and hence the current through the winding) and the number of turns. In fact the field strength is measured in “ampere-turns”. When the points open, there is no longer a current flowing through the coil, (except very briefly – as the condenser in the distributor charges up). Consequently, the magnetic field is not maintained and rapidly drops to zero. The sudden change of field around the primary windings generates a very short pulse of current which flows back to earth via the condenser, charging it up suddenly to about 250V (that is why the points spark). Underneath the Primary winding is a much bigger Secondary winding. The Secondary has many more turns of wire - usually well in excess of 16,000 (yes, sixteen thousand!) turns of very fine wire, about as thick as a hair. This acts in exactly the same way as a transformer, in that the rapidly changing current in the Primary induces a current in the Secondary. T he voltage across the Secondary equals that across the Primary magnified by the ratio of the numbers of turns. There are 300 turns on the Primary, 16000 on the secondary – the voltage is therefore multiplied up by a factor of over 50x. As the voltage induced in the Primary is about 250V, the final voltage on the secondary is as much as 15,000volts, or even higher on a “sports” coil. This very high voltage needs special insulation. Consequently, the inside of the canister is usually filled with special transformer oil and the output terminal, (connected to the King lead to the distributor) has a special shape and rubber cover. Some early coils have a small screw in the top that allows the coil to be refilled, however once the oil is contaminated, (i.e. if the coil has sparked internally) they should be regarded as beyond repair. The high voltage is routed by the distributor to the appropriate sparking plug, where the spark jumps across the gap igniting the fuel – air mixture. It is important to connect a coil the right way round. The spark that can be seen at a plug is actually the ionised air caused by the stream of electrons. Electrons are most easily emitted from a hot surface (which is why the valves in a valve radio have heaters – they are thermionic, literally “heat charged”). Also, they are most easily emitted from a spike rather than a smooth object, (which is why lightning rods are sharp spikes, so as to encourage the spark at that point). Consequently, it is important that the electrons flow from the point of the centre electrode, (which in its porcelain sleeve can be at a temperature of several hundred degrees in an operating engine) rather than from the cool outer thread. Swapping the SW and CB terminals of the Primary won’t do any harm, but will result in a feeble spark especially at high revs. If a car is converted from positive to negative earth, it is important to swap the CB / SW terminals over. It is surprisingly easy to damage a coil. As the resistance of the Primary winding is quite low, the coil will draw as much as five amps when the engine is stationary with the points closed. This makes it act like a thirty watt heater, which cooks the insulating oil. Once the oil has begun to carbonise, it becomes electrically conductive and then shorts the high voltage out internally. This is the so-called “breakdown” of a coil, which usually manifests itself as misfiring at high revs or when the engine is under load – basically the secondary voltage drops and the spark gets weaker. This is why it is essential never to leave the ignition on when the engine is stopped. This article, written by Geoff Hardman, originally appeared in CA7C Seven Focus in Apr 2007 pp24-25.